Minced fruit chutney and the SIF 99 hand mincer. After repeated experiments, and following the acquisition of a vintage hand-crank mincer (a Suffolk Iron Foundry, or SIF, no. 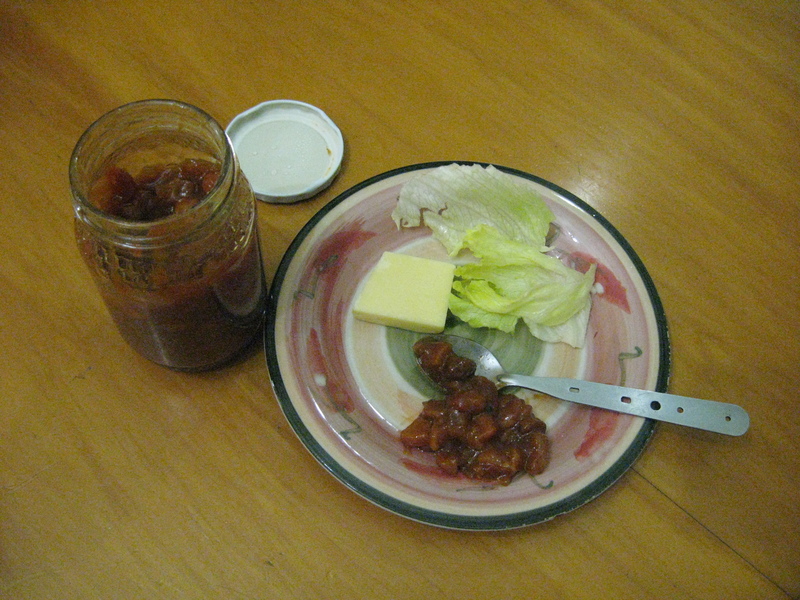 99, thanks to a close friend, Brigette Johnson, whose Baobab Antiquity Trading imported it from England), I have come up with what I think is an excellent chutney with taste, consistency and time advantages over my previous efforts. I should point out that the present recipe is subtly different from the one I previously posted here. I have increased the fruit, reduced the water and sugar, stepped up the cayenne, and suggested a tad of ground cloves to enhance the flavour. The result is a not too sweet, tangy fruit chutney that will go with curry, cheese or any bland dish that needs a bit of livening up (brilliant on cheese and ham sandwiches). I call it a “cuppa” chutney because everything is measured in cups. The exact volume is not essential, but use the same size cups (well, we don’t have any tea cups, we use small, sturdy 250ml coffee mugs). This recipe was made on Sunday 16 September 2012 with Khaya (Mwelase) aiding and abetting the process (and cranking the mincer!). 1½ cups dried peaches and apricots (just apricots if you don’t have peaches – we use the bitter , hard South African product, not the nice soft, sweeter Turkish variety). Soak the dried apricot, peaches and raisins in the three cups of water overnight. Drain the soaked fruit (keep the water!) and put it through the mincer with the onion, and tomato. Put everything (except for the Maizena®), including the water drained from the fruit, into a 4-litre stainless steel pot. Bring to the boil. 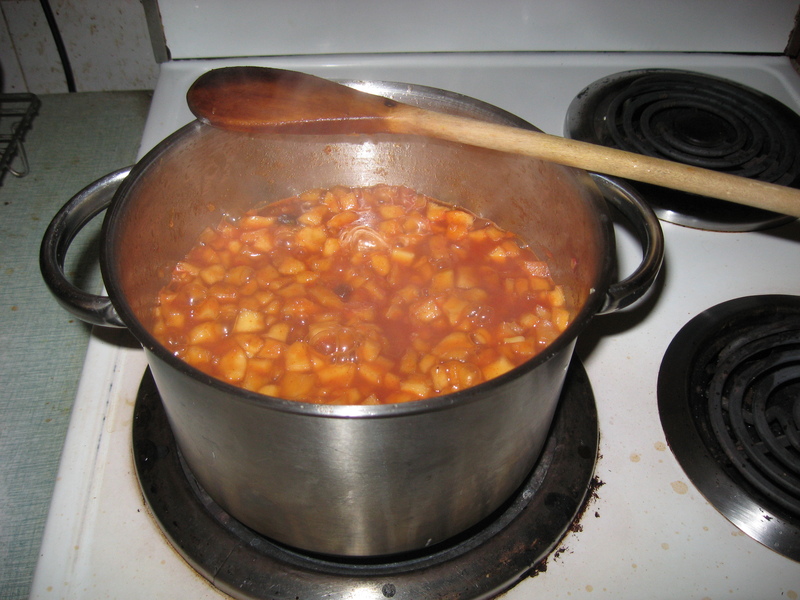 Once the mixture starts boiling turn down the heat to a slow boil or simmer. Keep stirring the mixture, to prevent burning on the bottom, for three-quarters of an hour to an hour. When the time is nearly up add the Maizena® and water mixture. Stir rapidly as it thickens for two to three minutes. Take the pot off the heat and immediately spoon the mix through a large funnel into bottles. Cap immediately. Using an indelible koki marker label the caps with the date. Makes 5 to 6 glass honey jars (not plastic unless you want them to go funny-shaped with the hot chutney). Quantity produced depends on how long you boiled the mix, and how you full you made the bottles. This vinegar and sugar rich chutney bottled hot in clean glass jars keeps well on a shelf (out of direct sunlight) for months. And no. You can’t use one of those electronic blender thingies. This is a chunky chutney, not baby food. Either use a (clean!) hand mincer or an electric mincer (using a coarse disc). Previously I laboriously hand-diced the dried fruit but could not get it small enough. And dicing raisins is hard, messy work! Believe me, mincing is the way to go for this chutney. A note on mincers: You can get a very expensive stainless steel hand mincer, but the good old-fashioned tinned (giving it that silvery colour) cast-iron hand mincer that Granny used is hard to beat. Fruit and vegetable mincers generally have a slotted cutting disc that cuts against a coarse multi-holed exit plate (usually a single series of 9 holes each 6mm in diameter). Meat mincers typically have a propeller-like set of four cutting blades that cut against an exit plate with much smaller holes in several series. You can use either. But it is essential that you clean the mincer, and particularly the plates, extremely well after each use. Just wash in soapy warm water, rinse and dry, using a pipe cleaner to dry the holes. You can prevent rust by using Spray and Cook® or Cook ‘n Bake® on the mincer and its parts and then assemble it. The spray works well but makes it a bit sticky. If you don’t like that you can keep the dried mincer parts in a container of dry rice instead. *Using a rusty mincer to prepare meat can give rise to food poisoning, or botulinism, if the meat is not thoroughly cooked afterwards. On 30 December 1932 Daisy de Melker was hung in Pretoria Central Prison at the age of 46 for poisoning her 20-year-old son, Rhodes, with coffee laced with arsenic. This was after she had “lost” two husbands from strychnine poisoning and had inherited the proceeds of their insurance policies. The murder of her two plumber husbands was never proved. Once you make your first batch of this delicious fruity chutney, family and friends will give you no peace. 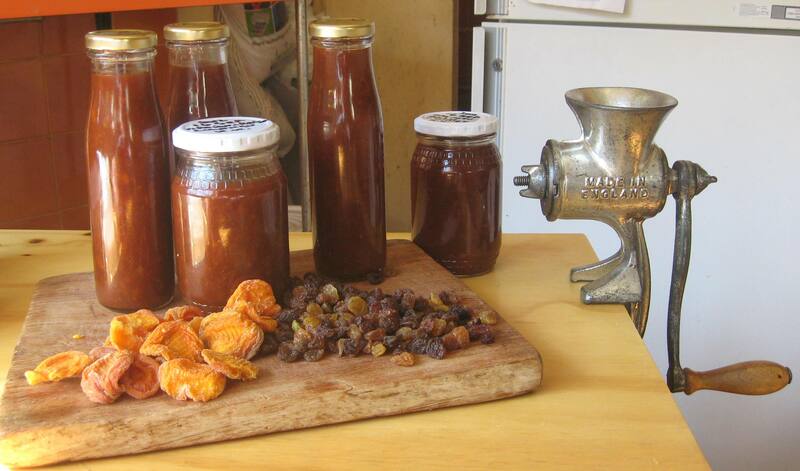 After much trial and error we finally settled on a basic practical fruit chutney that makes 5 honey jars at a time. We also make a hot chutney using our own home-grown and dried Cayenne peppers for those who prefer something with a bit of a kick. But it’s the mild chutney that keeps them coming back for more. 1 cup sliced and diced mixed dried fruit (or dried peaches, apricots etc). If you don’t have, then just add another cup of raisins. Bring to boil then turn down to simmer, stirring every so often to prevent burning on the bottom, for one and a half to two hours. When ready, before taking off the simmer, add three heaped teaspoons Maizena cornflour mixed with a little water. Stir until the Maizena thickens. Ladle into jars. The simplest way is to hold a jar at an angle over the pot and fill using a small pouring jug. Otherwise ladle into a funnel in the jar and use a wooden bamboo skewer to push the fruit lumps through. Wipe the jars (and their rims) and screw the lids on tight. Date each jar (year, month, date). You can eat it straight away, but it improves in flavour with keeping for a week or two. Keeps well for months in a cool dark cupboard.